You can get the Ring Video Doorbell Pro and Ring Chime Pro for $200 at Home Depot. If you want to keep an eye on who's at your front door, today's deal is for you. Home Depot is selling the Ring Video Doorbell Pro and the Ring Chime Pro for $200. Both of these devices at regular prices would set you back around $280, giving you a savings of $80. The deal is only available on Wednesday. We didn’t officially review the Ring Pro—the item on sale today—since it was an incremental upgrade over the original Ring Video Doorbell. Ring is a promising smart-home gadget that bridges the gaps between doorbell and security camera. The differences between the Ring and the Ring Pro include an upgrade from 720p to 1080p video, the addition of 5GHz Wi-Fi, and better control over security zones. It’s also slimmer than the original. The biggest difference, however, is that the Ring Pro needs to be hardwired to your home using your existing doorbell’s wiring. The original Ring is a stick-on affair that uses battery power. The Chime Pro, which comes in the bundle, acts as a Wi-Fi extender for Ring devices and an indoor chime for doorbell alerts. The Ring usually sends alerts to your smartphone meaning, only a person near the phone will know someone is at the door. This bundle is part of a larger Ring bundle sale at Home Depot. 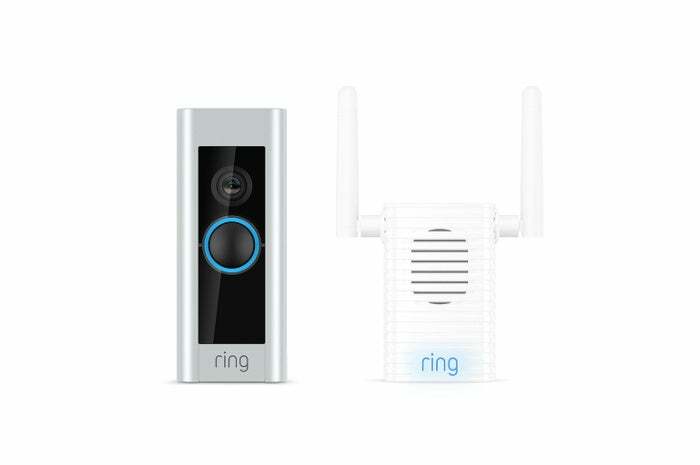 If you'd prefer a wireless version, the sale includes a Ring Video Doorbell 2 bundle. We awarded the Ring 2 a 4/5 star rating in our review, but this bundle is at a much lower discount percentage, and it costs significantly more than Home Depot's killer Ring Pro bundle.